Lee Sie is a photographer who was born in Utrecht Netherland, grew up in Northern California, and now resides here in sunny San Diego. 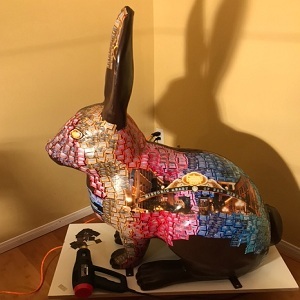 Lee heard about the “Rabbitville” public art program through Sparks Gallery- 530 Sixth Ave, which has a lot of his work exhibited and available for collectors. 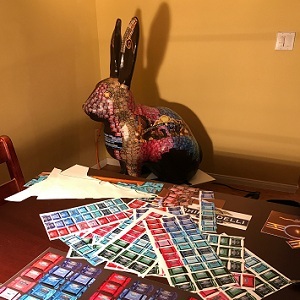 When Lee submitted his prospectus for the “Rabbitville” project he wanted to wrap the rabbit with a UV vinyl laminate overlay of his photos. “My photos were depicting photographs from monochromatic past to vibrant color present.” Said Sie. 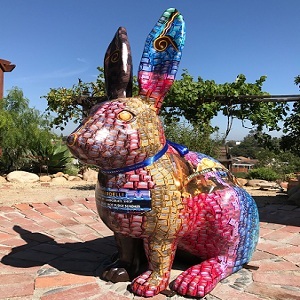 Lee Sie’s rabbit was the first scultpture that was sponsored. Lee had to collaborate with the sponsor on its design. Ghirardelli Chocolatier saw his prospectus in a catalog of 15 artists selected and thought it would be great to take his photographs of the 5th Ave. Ghirardelli location and the Gaslamp Quarter, along with their chocolate wrappers and of Ghirardelli’s headquarters in San Francisco. Lee: During the early 1980’s I was big into skateboarding and my father let me use his camera so that I could take photos of my friends in action. Every time we would go to a skate park or empty pool I would be the designated photographer. Very soon I became fascinated by the ability to capture the unique moments in time. How long have you been in San Diego? Lee: I grew up in the Bay Area of Northern California and came to San Diego in 1988 to attend college at San Diego State University. What is the name of your rabbit? 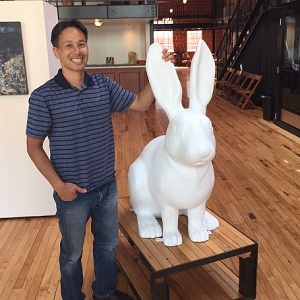 Lee: My wife and I talked about it and we definitely thought the rabbit was a girl and awfully sweet! She’s a chocolate bunny! So we named her, Nelly Ghirardelli. Your piece was the first to be sponsored, how was the process working with a sponsor like Ghirardelli? Lee: It was an honor to work with Ghirardelli! I was so excited when I found out that I was to be working on a design for them! The design staff was very supportive in providing me with insights and help in the creation of my idea. Was Creating Nelly Ghirardelli difficult? Could you explain the process? 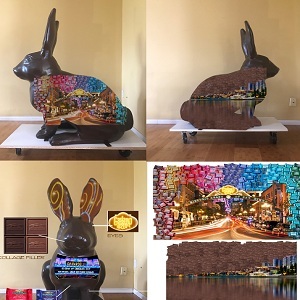 Lee: I Photographed each color of the chocolate wrappers then printed them along with other images onto a vinyl adhesive laminate. Over 1000 pieces were cut out by hand (with the help of my wife!) and then placed one at a time onto the rabbit creating a collage. The process was quite challenging to arraign but very fun to assemble! What up and coming events are you going to be painting/exhibiting? Lee: I will be unveiling my latest release Titled “Alter Ego” this July at Adelman Fine Art. Also a few of my newer images are now on display at Sparks Gallery in the Gaslamp Quarter. Lee: I am currently in the process of developing my latest photographs from Europe as well as organizing a personal photography tour to take place in Italy for the spring of 2018. 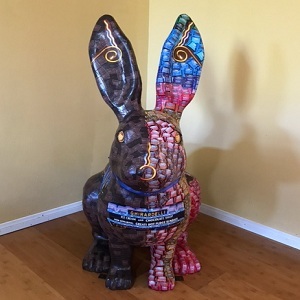 Make sure to log onto www.gaslamp.org/150/rabbitville to see the next rabbit joining the herd!